Time release protein blend. It provides more than 24g of proteins per serving. Complete aminogram. 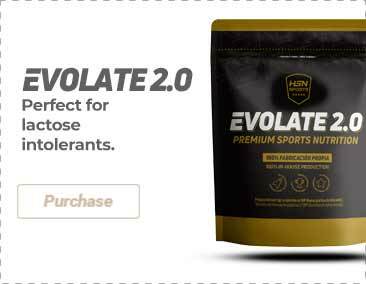 Without aspartame nor acesulfame-K. New formula! 100% Egg albumin powder. Excellent source of proteins low in fat. In-house production. Now with more proteins per serving. Raw ingredient from free hens. Carbohydrate gel with guarana and caffeine. It provides vitamin C, potassium and sodium. Carbohydrate gel without caffeine. It provides vitamin C, potassium and sodium. Available in several flavors and easy to transport. Pre-workout with Creapure®, amino acids, ALCAR and caffeine. New formats and flavors! Hydrolyzed Meat Protein. With extra L-Leucine and soy lecithin-free. New flavors and formats available. It provides more than 25g of proteins per shake! Plastic food container, ideal to store powder products. It includes screw tap! Hydrolyzed Beef Protein. With extra L-Leucine and soy lecithin-free. New flavors and formats available. It provides more than 24g of proteins per shake! 750mg of Kre-Alkalyn® Creatine Monohydrate per capsule. 8:1 Ashwagandha and Epicatechin in vegetable capsules. With Withanolides. It provides 400mg of Ashwagandha and 180mg of Epicatechin per vegetable capsule. Chewable BCAA'S 4:1:1. Forest Fruits Flavor! With Leucine, Valine, and Isoleucine. Exclusive formula: Magnesium + Zinc + Vitamin B6 + Aspartic Acid. Vegetable capsules. Now with more protein and without soy lecithin! Milk from grass-fed cows. Blend of carbohydrates (maltodextrin + oat flour) and whey protein. BCAA's 12:1:1 and Glutamine. Provides 14.5g of BCAA's and 5.06g of Glutamine per daily dose. The best BCAA's formula in the market! Whey Protein Isolate Hydrolysate. Now with more protein and acesulfame-K free! With Lacprodan®. Very nice intra-workout supplement. Citrus flavours are very refreshing and the powder is easy to dissolve in water too. Never seen a product like this before! I had to try it out. Mind you, this is not for you if you are in cutting phase. I went for the Chocolate and Cookies flavour and it is great! Very easy to digest protein which makes a perfect intra-workout. The flavour is very pleasant and it truly improves the post-workout recovery. Great intra-workout supplement. I combine it with my carb shake and the flavour is very nice. Even though it is a little bit expensive, it is worth it in order to avoid muscle cramps or DOMS. After long and tough path, investing all our efforts and enthusiasm, HSNstore has at last launched its own range of sports supplements, under the HSNsports brand. HSN has used the very highest standards of quality and transparency. Each HSNsports product has been meticulously developed in prestigious laboratories, bringing together chemists, nutritionists and professional athletes. All our products are manufactured in laboratories certified within the European Union. From the factory to your home. HSNsports is only available at HSNstore.com. We send our products out to clients without any type of intermediary, hence the great quality/price ratio.